Take the worry out of your party favorites. 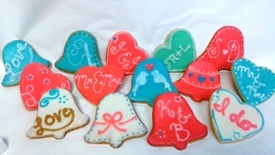 Let Cravings customize your party cookies with your wedding theme. Call us at 877-727-2846 and ask for a bakery manager.